The popular Greek holiday island of Rhodes boasts a particularly long summer climate, with its weather being directly affected by its warm , southerly position in the eastern Aegean Sea, west of Turkey. 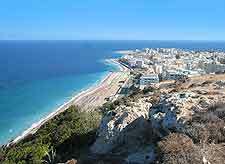 The climate of Rhodes is warm and pleasant all through the year, with the summer weather arriving as early as April and not beginning to cool down until November. Although much of the island begins to close down in December, when the tourism demand drops sharply, Rhodes City itself remains full of interest and a large number of the city's shops and hotel remain open the year round. With average January temperatures of around 12°C / 54°F, the warm winter climate this an appealing to visit for some, when peaceful island life means less tourists around the main sights. However, if you are intending to holiday on Rhodes any time between December and February, visitors will discover that the ferries become more unreliable, often only sailing in reasonable weather, which can mean a choppy crossing. Although there is still plenty of sunshine to go round during the winter season, the sea remains to cold for swimming, unless you are feeling very brave. 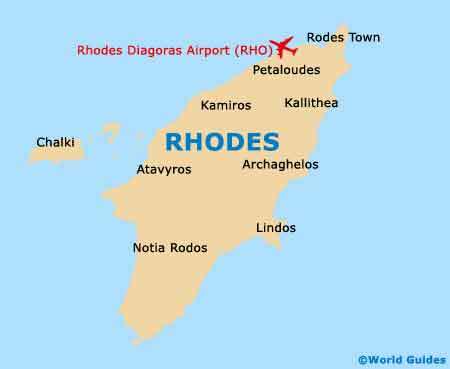 The summer climate on Rhodes attracts the most tourists and this lengthy heatwave sees temperatures climate sharply in May and June, soon topping 30°C / 86°F during the very hottest of weather. Crowds flock to the beaches to soak up the Greek sunshine, although if you prefer to sit in the shade, there are plenty of places where you can relax and enjoy a gentle sea breeze. More and more people are choosing to holiday on Rhodes during the spring and autumn, when the climate is especially fresh and appealing.